Assistance League of Diablo Valley is a 501(c)(3) organization. Your contributions are fully tax deductible. Assistance League is an all-volunteer organization therefore your contribution is maximized. All donations stay in Contra Costa County, benefiting adults and children in need through philanthropic programs. Your gifts are greatly appreciated. Please note that many states require pre-registration for internet solicitations, and therefore Assistance League is only able to accept donations from within the state of California at this time. Assistance League of Diablo Valley is a longstanding GuideStar Exchange Gold Participant! Click on the GuideStar logo to review the Nonprofit Report on Assistance League of Diablo Valley provided by GuideStar Exchange. 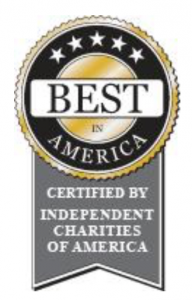 Assistance League of Diablo Valley is proud to have received the America’s Best Charities Seal of Excellence. It is awarded to charitable organizations that have proven that they meet the highest standards of public accountability, program efficiency and cost effectiveness. Making a donation through Assistance League’s secure server is fast and easy, and when your donation is received, you will receive an acknowledgement in the mail for tax purposes. Click the link below to make a donation. Participate in Assistance League’s annual direct mail fundraising campaign. Add your name to a mailing list, and reply with your donation when you receive the fundraising mailer in the fall. Please be included in this important source of funding for philanthropic programs. Your shopping makes a difference. 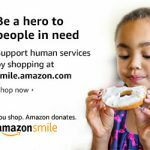 Do your regular Amazon shopping at smile.amazon.com and Amazon donates to Assistance League of Diablo Valley. Proceeds from the Assistance League Way Side Inn Thrift Shop help fund its philanthropic programs. Bring your donations of new or gently-used items to the thrift shop at 3521 Golden Gate Way, Lafayette CA 94549. Stay to shop. You will find quality merchandise at affordable prices. Please consider Assistance League of Diablo Valley as a recipient of the funds from the sale of your car, truck, motorcycle, RV boat, airplane, farm machinery or heavy equipment to support community based programs. Just click on the car graphic below and Vehicle Donation to Any Charity (V-Dac) will pick up and sell your vehicle, running or not. They will send you a tax receipt and the proceeds will be given to Assistance League to support philanthropic programs.